PHILADLPHIA – The No. 11 University of the Sciences women's basketball team defeated Wilmington 83-39 in Central Atlantic Collegiate Conference (CACC) action at Bobby Morgan Arena on Wednesday evening. USciences scored the first 10 points of the evening en route to a 21-6 lead after 10 minutes and a 44-17 advantage at the break. All 13 Devils to play scored, led by Alex Thomas (St Elizabeths) game-high 14 points. Irisa Ye (12 points), Colleen Walsh (10) and Jess Huber (10) were also in double figures. Kendall Keyes (eight points) and Juliana Gura (five) each scored season-highs. University of the Sciences (15-1, 6-1) outrebounded Wilmington 50-32, the program's first 50-rebound game since Jan. 25, 2014 against Caldwell. Taylor Hamm led all players with nine, while Ye and Brigit Coleman (season-best) each added six. Ye also tied Mikaela Giuliani (career-best) with a team-high four assists. 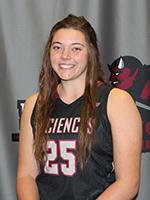 University of the Sciences also fell one 3-pointer (12) and one assist (21) shy of its season-highs. The Devils held Wilmington to just 24.2 percent shooting (15-of-62). University of the Sciences travels to Post for a 1 p.m. tip this Saturday, Jan. 19.